Reminiscent of a town on America’s West Coast, Mihama American Village is a popular tourist destination offering great shopping, excellent dining and exciting entertainment all in one place. Mihama American Village is always bustling with people looking to catch a spectacular sunset while enjoying a leisurely stroll along Sunset Walk, or to simply soak up the distinctive atmosphere of a resort town. A variety of street performances and live music shows take place daily around Mihama American Village, which is known as a gateway to success in the entertainment industry. 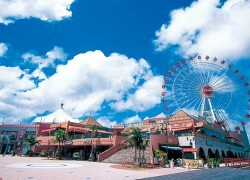 Mihama American Village consists of shopping mall Depot Island, which is located near the water and has more than 100 stores; Carnival Park Mihama with its iconic Ferris wheel; and Dragon Palace, a shopping and amusement complex. Most places in the area are open from 11:00-23:00, but some stores keep different hours.